Edition of 836 of which 125 copies are signed 1-125, 27 copies are signed A-Zz as artist's proofs. One set of progressives. Two dedication copies are signed. Some plants simply do not want to be eaten, or want to be eaten by specific animals and not eaten by others. Most plants don't want to be eaten by bugs. Plants can't run away and hide when something comes along and chews them up, and thus have evolved toxins, tough skins, spikes and thorns or more symbiotic strategies like, "eat this part and not that part and do me the favor of spitting out the pit when you're done." In time, animals overcome these defenses and plants evolve new ones. Chili peppers, apparently, want to be eaten by birds (which cannot taste the spicy capsaicin) because the birds eat the fleshy peppers and pass the seeds, undigested, in a considerate packet of fertilizer. Mammals, on the other hand, which would crunch up the seeds, can taste capsaicin just fine, and avoid eating hot peppers. Until people came along that is. People will eat just about anything, and what's more get to like it. So the plant's defense mechanism turned out to be its greatest draw: picante is a taste sensation unlike any other, and varieties of peppers are eagerly sought and cultivated worldwide. People didn't start out liking Chez Panisse, either. The portions were too small; the food unfamiliar; the prices were too high; it was never the same way twice. Bitter complaints were as common as enthusiastic praise. But, the restaurant started to grow on the community; then engendered similar restaurants; then became a staple. Forty-two years is a long time, and not many remember the rather dismal culinary conditions that prevailed before Alice's "delicious revolution." 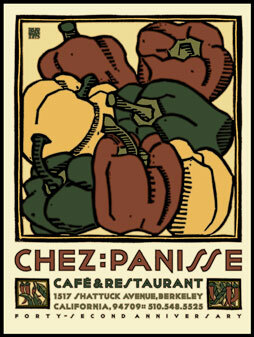 Just like hot peppers, Chez Panisse crept into the world's cuisine and now we can't do without it. It's an acquired taste.